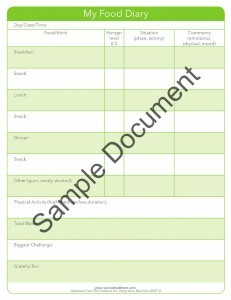 The Food Diary is a must-have worksheet for structuring your client sessions. When a client tracks his/her food, mood and hunger level on the Food Diary worksheet, it is a starting point for the two of you to have a “day-in-their-life” conversation about both “primary” and “secondary” food. As a coach, you will find that your clients’ completed daily Food Diary provides clues and pieces of their unique puzzle to help uncover food sensitivities and create awareness of their relationship with food.Use the Food Diary tool with all of your clients to help them make “good, better and best” changes to their food and lifestyle choices and keep them on track toward reaching their goals.